I’ll admit that I’ve put off starting to write about spurges (Euphorbia), partly because I feel I don’t know enough about them, but it’s time to take the plunge. They are such curious plants, as if assembled on another planet from a description given over a dodgy radio link from a non-botanist on Earth (I’ll say what I can about their evolution in a later post). They’re deeply weird and I’m fascinated by them. Let me list some of their oddnesses. 1.They seem to be flowering plants without flowers –at least, without petals. In fact the flowers are very small and rudimentary and the place of petals is sometimes taken by coloured leaves, e.g. in poinsettias (botanical name Euphorbia pulcherrima,or ‘very pretty spurge’), or by small bracts. 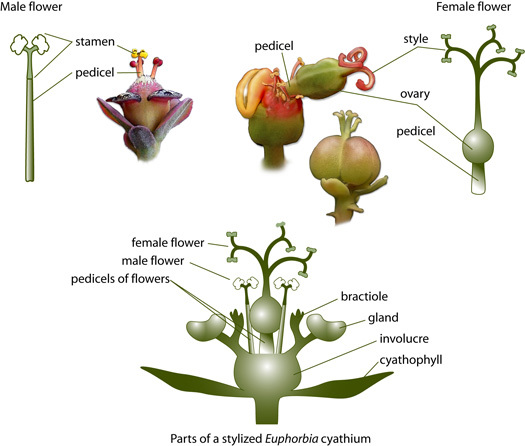 Male and female flowers are separate – not a unique feature, but unusual. The nectar glands are sometimes as big as the tiny flowers. 2. 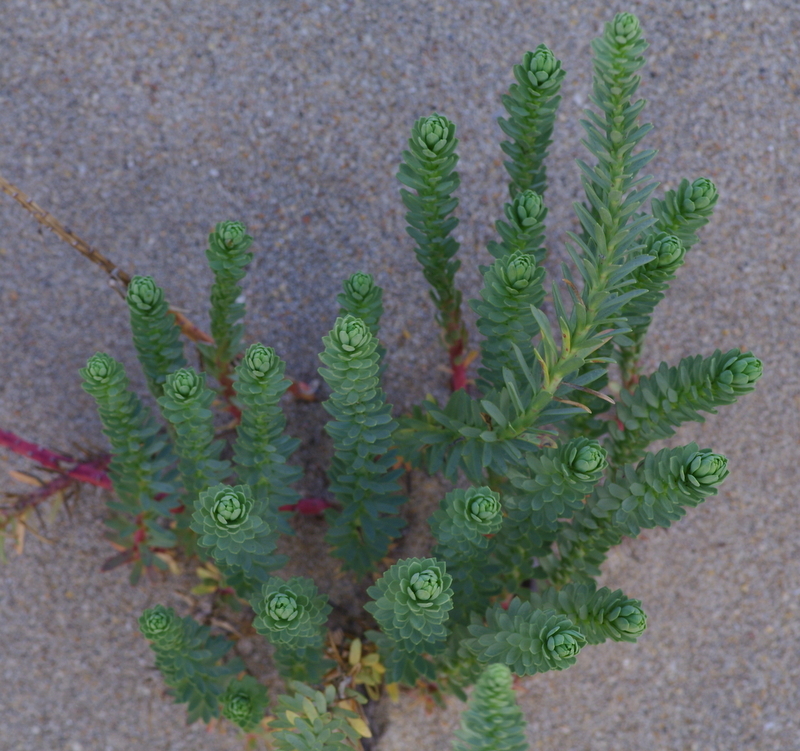 Their whole growth habit is odd – a spurge is like a succulent plant, often hairless and smooth to the touch, as if half plant and half animal – a reptile maybe, or as if made of some new plastic. Most Mediterranean species consist of a tall pinkish stem circled by simple stalkless glaucous (grey-green) leaves and crowned by a complicated inflorescence. 3.They are closely related to plants varying wildly in form: round succulent stems the size of baseballs, spiny succulents resembling cacti, spiny bushes, even trees. Is it in spite of, or because of, all these oddities that they’re so successful? The Euphorbia genus contains over 2,000 species – the second-largest genus in botany. The family Euphorbiaceae comprises at least 7,500 species. 4. They exude a white sap if cut, which contains toxins which are violent purgatives, hence the name ‘spurge’. The origin of the name of the genus is interesting, but I’ll leave it to next time or we’ll be here all night. Such a lot to say – for this post I’ll just show a species I saw recently, and a close relative from the same family but a different genus. 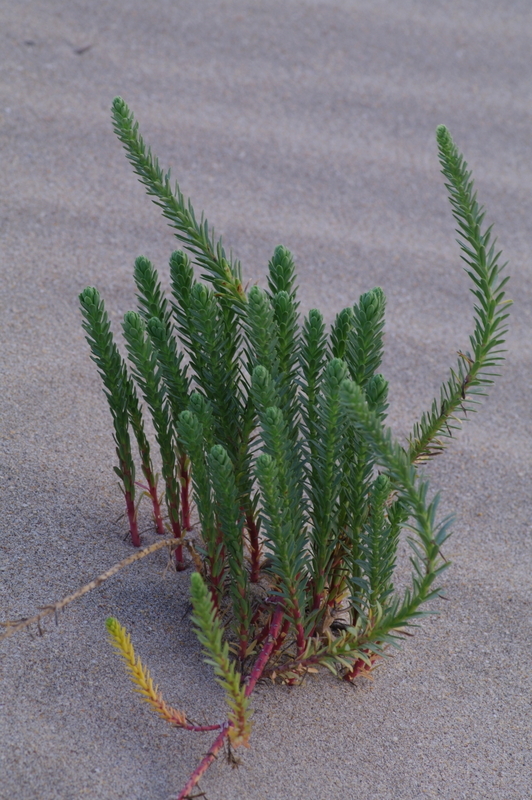 So, let me introduce you to the sea spurge – Euphorbia paralias – a perennial, often found growing in clumps in sand dunes, like this one. In fact most spurges prefer dry, sandy or rocky soils, in full sun. You can see the simple stem and leaf arrangement – it’s characteristic of this species that the leaves overlap, giving it a sort of bottle-brush appearance. 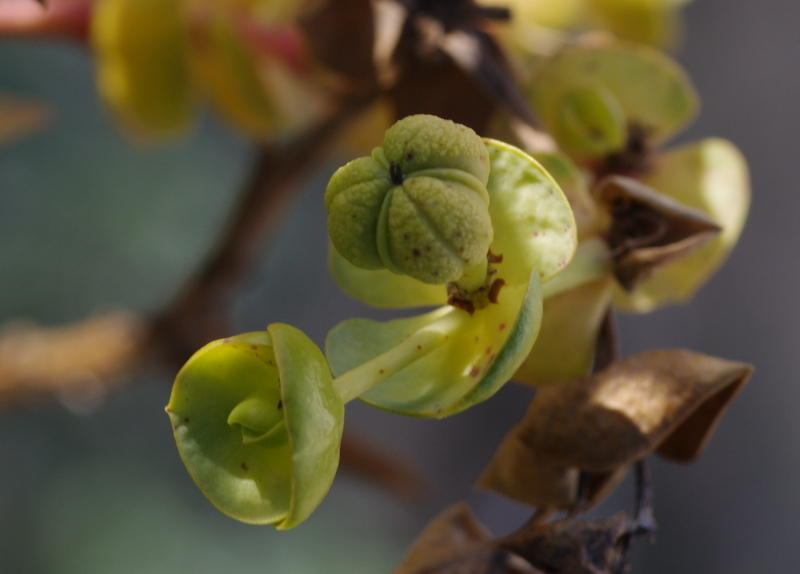 In December when the photo was taken the flowering was over but you can see the fruit, a three-lobed capsule as in all spurges – a swelling of pretty well the whole female flower, which is on a stalk or pedicel. The structure next to it contained a male flower – there are usually several – reduced to consisting of a stamen on a stalk. The fruit capsule splits open explosively to scatter the seeds. Thus what looks like a flower is in fact several, male and female, grouped inside two blades which seem to be half leaf, half petal, and which are called the cyathophylls – the whole structure being called not a flower but a cyathium. 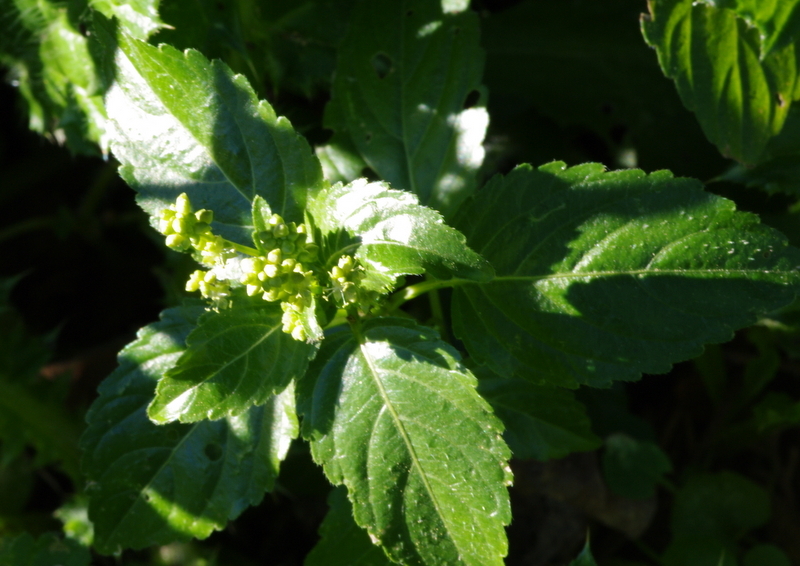 Now the relative, Mercurialis annua (annual mercury), also a member of the Euphorbiaceae and a common weed throughout Europe. Here the male and female flowers occur on separate plants – this plant, like the others near it, was a male, as you can see if you look closely at the picture – there are tiny stamens poking out of the simple flowers. I haven’t found a female plant to photograph yet, and I think they prefer different habitats – I’ll keep you posted. I’m not the only one fascinated by spurges – ‘Happiness is a state of Euphorbia’ proclaims one person’s website dedicated to these plants. And all the basics you need to know are very well explained, with diagrams, on the site of the international study group for this family of plants, the EuphORBia Portal (so named to indicate the comprehensive and planetary scope of the project) – click on the link here. If I want to mark how odd these plants are, I can think of nothing better than to show some clips of the musician Sun Ra. Here he is in the film Space is the place (1974) trying, hilariously, to explain himself to members of a black youth club. Maybe spurges came from his planet. Coming up next: more stuff you didn’t want to know (till now) about spurges.